Today, online stores are among some of the most popular forms of business activities. They have a whole list of advantages. For the owners of such stores, Some of the advantages are; 1. the absence of the rental premises and public services, 2. fewer requirements to complete the work of employees, 3. remote management software delivery across regions and other countries. And the buyers also enjoy the opportunity to purchase any product from the comfort of their apartment. Today we look at the Top 5 E-commerce website designers for creating an online store. What to look out for when choosing a web designer for your platform? E-commerce giants such as Aliexpress or well-known Amazon can afford to develop their own platform for their online stores. Doing so costs a significant investment, but the company of this magnitude are able to quickly recoup these costs. However, a novice trader needs to better pay attention to ready-made solutions. They greatly simplify business start-up and do not require too much expenditure. Moreover, it is up to you If you want to use an existing platform for creating an online/e-commerce store for free or for a fee. Price depends on the diversity of instruments, the choice of design and other factors. I will try to make a selection of the most popular options today. By the time I am through, you will surely be able to find a suitable one specifically for your plans, or at least decide what you need. Generally, ready-made solutions are the best option to start the business. As you gain experience, it will be easier for you to figure out what kind of features and tools you need in your online store. And for the first steps of a fairly simple constructor/web designer. In a layman’s language, they are a group of professionals who can help you build a site, on the basis of which you will be able to open your own trading platform. They help you with the name(if you don’t already have one in mind) and choose the look. Also, it is their job to customise the interface to your liking. To this end, web designers have the resources to provide detailed instruction for beginners, as well as technical support, they can turn to with questions arising in the process. Do not immediately rush into the building an online store without understanding the mechanism of pre-operation of this kind of business. uCoz combines powerful functionality with reasonable rates and great deals for business. There is a separate package “Internet-shop” among the services provided. Thanks to the loyalty program, within two days after the registration, a new user receives a decent discount (50%) from the standard 7.99 per month (95.9 dollars/year). Also, as a bonus, registered users will receive whichever premium template and your own domain name. What is in the offing at uCoz? In addition, the site allows you to configure a large number of modules that work directly with the code. 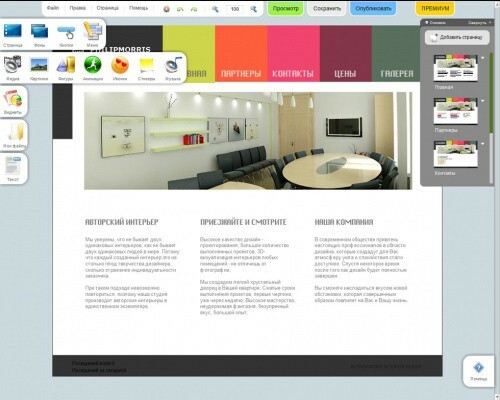 Similar to uCoz, Wix is a simple and clear platform for creating a website online store including an online store. It allows you to create a resource for free. However for the comfort, ease of use and advanced functionality it is advisable to opt-in to one of the tariff plans. There is a special e-commerce package, in which the cost is $ 16/month. There is a built-in widget specifically for creating an online store. • Setting the parameters of discounts, payment, etc. WebAsyst is now considered one of the most popular designers of websites. This is not surprising. The service provides its users with advanced features, a huge number of settings and design templates. The set of plug-ins (about 400 pieces), making it easy to configure the system to fit your enterprise needs. Some of them are paid, some can be set completely free. Also, you can get free pattern numbering like about a dozen. But if you pay an adequate price you can get like 2000 and more vivid performance. Finally, there are a sufficient number of training materials to assist users and technical support. Nethouse.me has enough broad functionalities and tools, service plans within a reasonable boundary. Depending on the selected tariff, services will be available in either a small space of like 50 items or as much as on 1000 items. Nethouse is a simple, reliable and inexpensive platform for doing business in the field of e-commerce. And much more. In addition, when you pay the fare once for 3 months, the customer will be presented with a free domain. Overall – a decent and affordable tool to create your own online store. When you come on a Jimdo site, the first thing that catches your eye is the ease and comfort. That is how you can describe the appearance of the designer. For ease of use, albeit with relatively limited functionality, Jimdo is perfect for beginners. For instance, to understand the structure and operation of this service will not be difficult for a beginner. Jimdo as a web designer focuses mainly just on e-commerce. As a result, you can quickly use this platform to create a small online store. Large selection of templates is only available in the paid tariff plans. A distinct advantage and a highlight of Jimdo is that it has mobile clients for Android and iOS, which makes site management easy from anywhere in the world. , but it is worth considering that the rates one can buy only once a year.